Students will work in a specialized classroom and practical laboratory learning how to cut and join metal parts through the application of arc welding. Instruction includes: selection of proper torch tips; adjustment of gas pressure and flame according to the size and characteristics of metal; selection of proper electrodes; adjustment of voltage and current for the type of metal; flame cutting, and use of equipment introducing a shield of inert gas (MIG-TIG & FCAWP), around the electric arc to prevent oxidation. Instruction also involves classroom and practical experiences to teach students to fabricate and weld joints and perform fabrication in the basic area of welding. Related instruction in blueprint reading and layout is included as an integral part of the program. Safety instruction is provided throughout the program and safe practices and procedures are stressed in all lab situations. To get started in the Welding Technology program, Sign Up today for a program orientation! 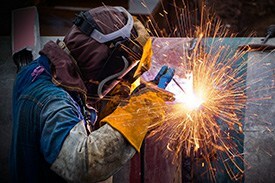 Demand for Welders is expected to grow 6%* between 2014 and 2024.